Women, social class, and migration were three key elements in Kang Kyeong-ae’s fictions. “Salt” has all those elements. Critics say that Kang opened up a new horizon for women’s literature in Korea in the 1930s. Discarding the male-centered narratives, her stories presented the problems of low-class women stricken by poverty, which was pretty shocking at the time. She picked up each soybean block and sighed habitually while muttering, “I should make about three urns of soy sauce and a pot of spicy sauce. I will need about 40 liters of salt for that.” Back in their hometown they used to even brush teeth with salt. But since they came here, she secretly cried over salt many times. 그는 무의식간 한숨을 푹 쉬었다. 이곳 온 후로부터는 그는 소금 때문에 남몰래 운 적이 한 두 번이 아니었다. “Salt” is a story about a woman who migrated to Manchuria during the Japanese colonial period. Manchuria was a crucial region in Korea’s modern history. Most of the Koreans who migrated to Manchuria were poor farmers driven away and rendered hopeless by the Japanese occupiers. Salt is a symbolic item that represents the harsh environment of Manchuria. Salt is very common in Joseon, but not in Manchuria. Koreans, who used salt for just about everything, from pickling to seasoning their food, had to eat bland food when they moved to Manchuria. Not only that, salt was extremely expensive in Manchuria. The difficult lives of Korean migrants in Manchuria, where salt was scarce, were represented by salt. 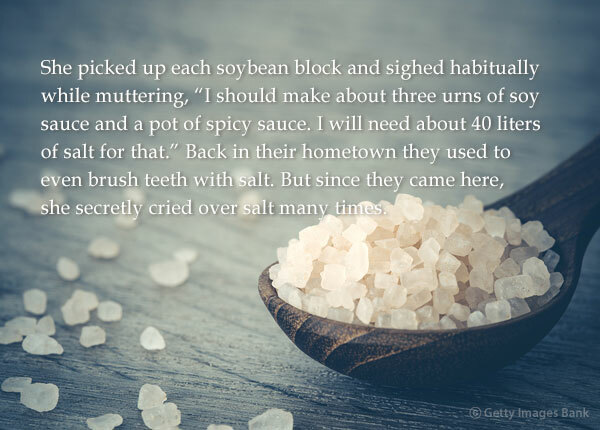 Secondly, salt symbolized the pain and troubles that seemed to plague Bong-yeom’s mother. She jerked up, startled. Two men in suits had the salt sack out and were glaring at her. Having realized that they were police officers, she began to shake uncontrollably. Just like the time when she tried desperately not to drop the salt sack in the Tumen River, she felt her senses become sharper. 어느 때인가 되어 무엇에 놀라 그는 벌떡 일어났다. 양복쟁이 두 명이 소금자루를 내놓고 그를 노려보고 있다. 그는 그들이 순사라는 것을 번개같이 깨닫자 풀풀 떨었다. 그의 신경이 날카로워지는 것을 느꼈다. Kang Kyeong-ae: Born to a poor farmer in 1906 in Songhwa, Hwanghae-do Province in what is now North Korea. Her writing career began when she published “One Book” in literary magazine Keumseong in 1924 and “Pageum,” meaning a broken zither, on leading newspaper Chosun Ilbo in 1931. In the same year, she moved to Yongjin in Manchuria to devote more time to writing. “Salt” was published in 1934.